We met Billy at a sculpting art night hosted by AAFH at the Ronald McDonald House (RMH) in Winfield, IL on Thursday, August 18, 2016. William (Billy) is a 13-year old who loves music and wants to learn how to play a banjo. Many of his family members play musical instruments and Billy has watched his grandpa, uncles and cousins play guitars and banjos. Billy lives in Lyons, IN with his family. He was diagnosed with several brain tumors in July 2016. Billy is being treated at the Proton Center in Warrenville, IL and receiving radiation therapy for the next several weeks. That evening at the art night event, Billy asked if he could receive a banjo as a gift and how long it would take. Billy was told we would call one of our musical store partners, the Instrument Exchange, and find out if the owner, Tom, might have one in stock. 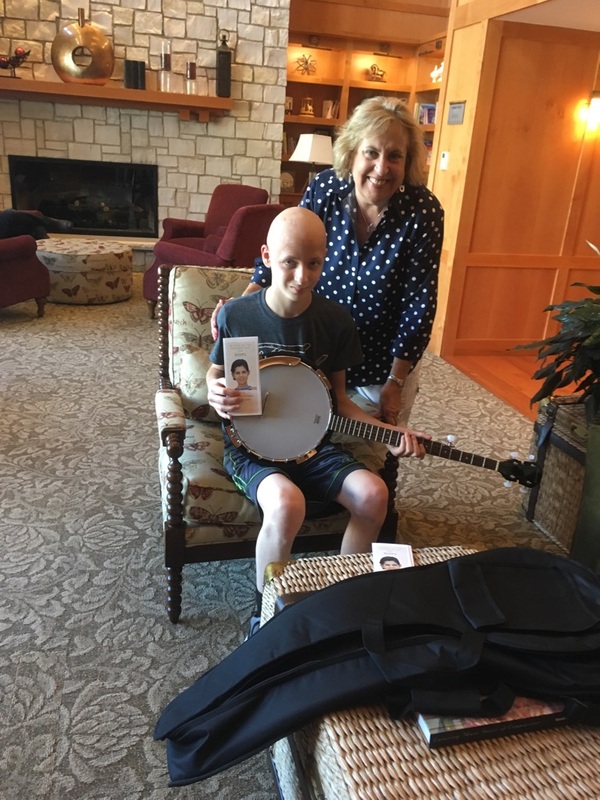 Billy’s grandma completed the gift request form on the AAFH website and Yoli, AAFH-President, arranged to pick up the banjo the next day as Tom confirmed he had several at his music store. The next day both Mary Jane, AAFH Board member and Yoli delivered Billy his new banjo on Friday, August 19th. Billy was really excited and happy with his new shiny banjo! AAFH is honored to be able to fulfill Billy’s gift request and share a bit of joy and hope to him and his family!